The eldest Tot Tester has been trying out an LED portable nightlight, from The Torchshop. 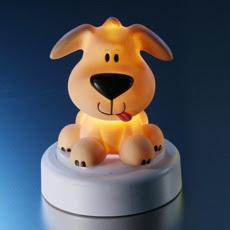 The light, in the shape of a dog (others are available in the range), is easy to use for both parent and child. It simply requires pushing down on the top of the "dog" to light up. It gives off a soothing glow, making it perfect for children who may be scared of the dark, without having the over brightness of a standard torch. The nightlight is battery operated, requiring normal AA batteries (which can be purchased cheaply from most supermarkets), and can last for a minimum of 120 hours. It has a low power consumption,due to it using the latest LED technology, using just 0.1 watts, which obviously helps to make the batteries last longer. It generates no heat either, making it safe for children's bedrooms without fear of nasty burns to little fingers. The character is cute as a button, and wouldn't look out of place in a child's room due to the cartoonish features. Tot loved having this on her bedside cabinet, and quickly learnt to tap it to make it work. The great thing about this nightlight is the portability of it- when I was a child, a nightlight had to be plugged in so was static to one place. However, this has the dual feature of being a great light for in the bedroom, and its light enough to work as a torch for older children making a trip to the bathroom in the dark at night. Available from the website at £9.99, its cheaper than other torch nightlights available, and the company offers free UK delivery,which is a bound to attract savvy buyers. A great affordable stocking filler.